I used to think I was a Mega Man expert. 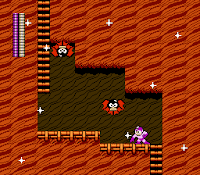 Then I made the mistake of poking around YouTube for a video of a particular glitch in Mega Man 2. I received a comment on one of my Mega Man YouTube videos that it's possible to pause the game at the exact moment you use Flash Man's weapon, thereby glitching the game into giving the weapon infinite energy, or something like that. Wait--someone knowing something about Mega Man that I didn't? Preposterous. So I tried the glitch. Repeatedly. It didn't work. Maybe I didn't exactly understand what the comment was trying to convey. I searched the Internet for any written references to this glitch. There weren't any. Maybe I didn't search hard enough. I looked to YouTube for an answer. Maybe, just maybe, somebody recorded this dubious phenomenon. Then I stumbled on MGXGOD's channel. Now, I didn't sift through every single video there for my answer, but I saw things I had never even thought to do with the Mega Man games. Glitches and techniques I had never heard of. Pointless tricks that, given my penchant for fiddling around, I should have discovered long ago. I was supposed to be the Mega Man Master. I was supposed to know all the tricks and glitches. I'm better at the Mega Man games than any other game I've ever played, and some of the crazy stunts I've pulled in my YouTube videos are a testament to that. Yet, in moments, my little empire was toppled by some hotshot who demonstrated something that I, the Mega Man Master, never figured out. Boy, did I feel dumb. But in my defense, I probably discovered most of those glitches when I was younger, but just forgot about them. I mean, what other explanation could there be? There's a good lesson here: No matter how big a geek or expert you may be, there's always someone bigger. You might be able to recite every line of Monty Python and the Holy Grail, but there's always someone else who can do that and perfectly mimic the characters' outraaageous accents. On the one hand, this is kind of depressing if you think you have some sort of geek claim to fame that nobody else can match. You may be a local novelty with your small stockpile of imported European candy, but in the grand scheme of things, there are plenty of other people with small stockpiles of European candy. Such as everybody in Europe, potentially. Makes a person feel way less special, I can tell you that. On the other hand, realizing this can help to keep one's ego in check. Of course I knew there must be people who are better than me at Mega Man, but because I intentionally avoid watching speed runs of the games, and because I don't often watch the few Mega Man fans around me actually playing the games, I sorta got it in my noggin that, if for no other reason than a lack of active competition, I was the Mega Man Master. Ah, but to be a true master, I'd need to get through an entire game without ever getting hit. For starters. In a way, realizing that there's always someone better than you is a motivation to quit resting on your laurels and start improving so that you can garner more laurels to rest on at a later date. What I needed to remind myself of was that, even though these videos revealed I didn't know everything there was to know about Mega Man, these videos didn't take away from what I had accomplished. I can still truthfully say that I've beaten the Yellow Devil without getting hit. 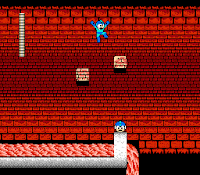 I can still accurately report that I can get through the disappearing brick challenge in Heat Man's stage without using any support items. Heck, maybe there are things I've done that this MGXGOD person hasn't ever thought of. Even if I'm totally redundant in the video game community, if other people--or even just one person--can do everything I can, and then some, I can still be content with my own achievements. I'm of the belief that every self-proclaimed geek should have at least one geek claim to fame, no matter how minor or common--I don't need to be the Mega Man Master; just a Mega Man Master will suffice. Preferably a Mega Man Master who knew whether or not this doggone glitch with Flash Man's weapon is real. Doggone it. I think things like this are why the modern Achievement systems are so popular; they give you a concrete way of measuring yourself against other people in the same game. A meta-game of competing without actually competing! Exfanding Your Horizons Turns 1 Year Old! Alex Writes About a Video Game? !